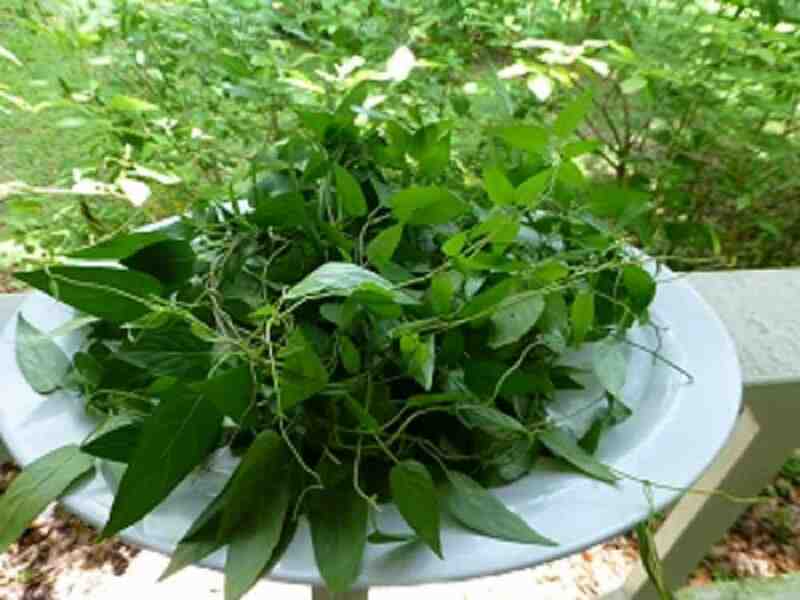 Skunk vine, Paederia foetida, is a vine that grows to about thirty feet in length with woody stems at maturity. It is in the Rubiaceae, or madder, family. It has become a problem in the United States in areas where it is able to flourish such as the mild climates in most of Florida and scattered counties throughout Georgia, Louisiana, North Carolina, South Carolina, Texas, and Hawaii. 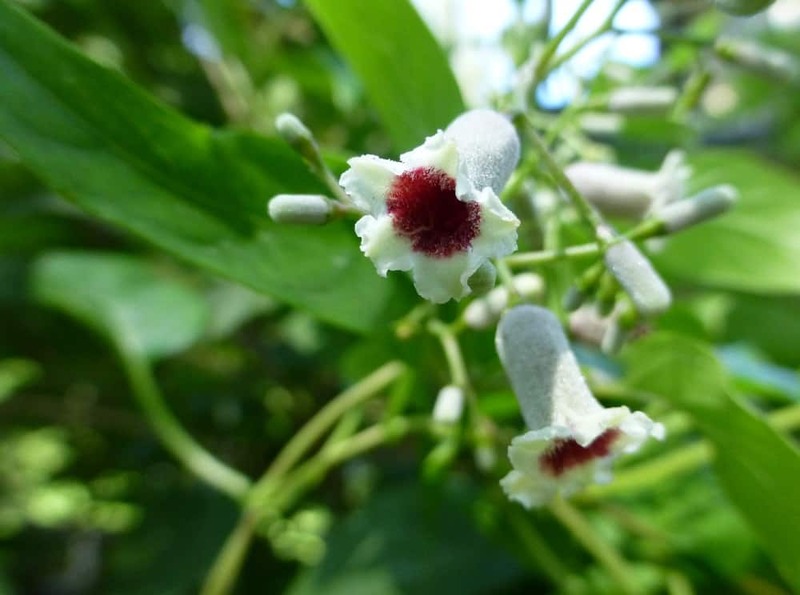 Other common names are stink vine and Chinese fever vine. It can grow, and thrive, in just about every plant habitat in Florida and can adapt to salt and water intrusion. It grows in part shade to full sun in dry to moist soils. Skunk vine was introduced into Florida around 1897 at the USDA Brooksville Field Station as a potential fiber crop. It is native to the southern region of Asia. It is native to Bangladesh, Bhutan, Cambodia, China, India, Indonesia, Japan, Korea, Macao, Malaysia, Myanmar (Burma), Nepal New Guinea, Philippines, Singapore, Taiwan, Thailand and Vietnam. Skunk vine has opposite leaves that are oval to linear-lanceolate in shape. The margins are entire with rounded to lobed bases. In frost free areas it grows as an evergreen and does not lose its leaves in the winter. The underside of mature leaves are pubescent and feel slightly rough to the touch. However, new leaves are more glabrous on the under sides and feel smoother. 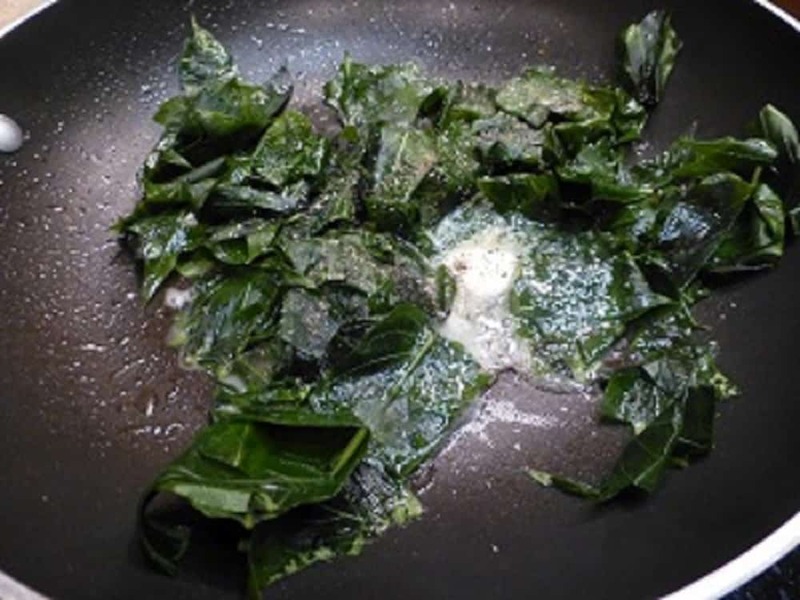 The leaves emit a sulphur smell when crushed or bruised, but lose it once cooked. The flowers are small and white to cream colored with bright magenta centers. In Florida the blooms appear from May to August. The fruit is a small, golden, globe. The fruit is most easily seen during the winter when surrounding foliage has died back. The fruit/seeds are distributed mainly by songbird droppings. Paederia foetida is commonly used for medicine and food in China, Japan and India. The leaves and bark are used either fresh, dried, or as herbal infusions. Medplants blogspot has some information on those uses. Once a person over comes the stigma regarding the smell it is quite a useful food plant. Recipes online are few and far between, but Soyuz Sharma has a delicious looking recipe for Stinging Catfish with Paederia Foetida that uses ground up leaves and I can’t wait to try it. Paederoside is among several glycosides produced by the plant. An enzyme splits paederoside to sulphur containing methyl-mercaptan and it is released when the plant tissues are ruptured. 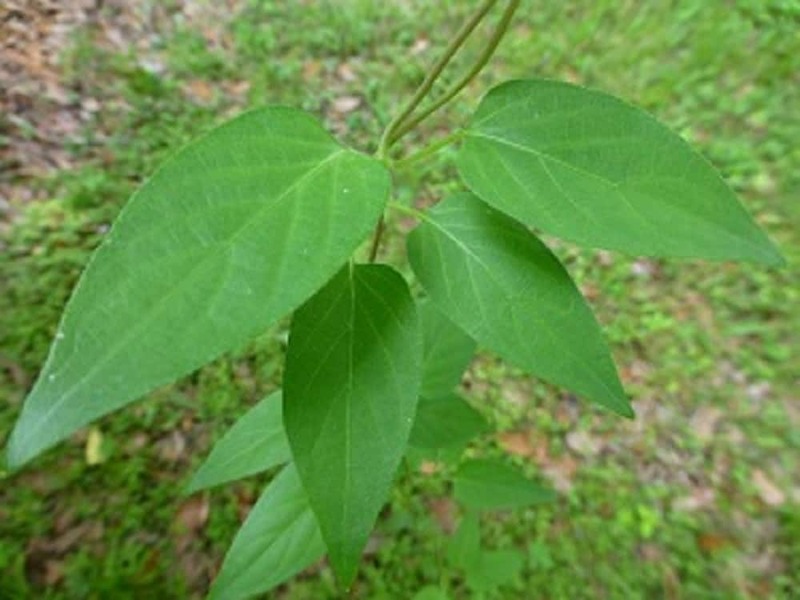 Studies reveal that paederoside is anti-oxidant, anti-bacterial, anti-nocicpetive, analgesic, anti-inflammatory, diabetic, and hepatoprotective. Skunk vine is high in nitrogen, phosphorus, potassium, and magnesium. It has been postulated that the presence of ursolic acid, oleanolic acid, arachidic acid, and beta-sitosterol may be responsible for its anti-ulcer activities. Ignorance has kept me from utilizing this plant as a food source for years. 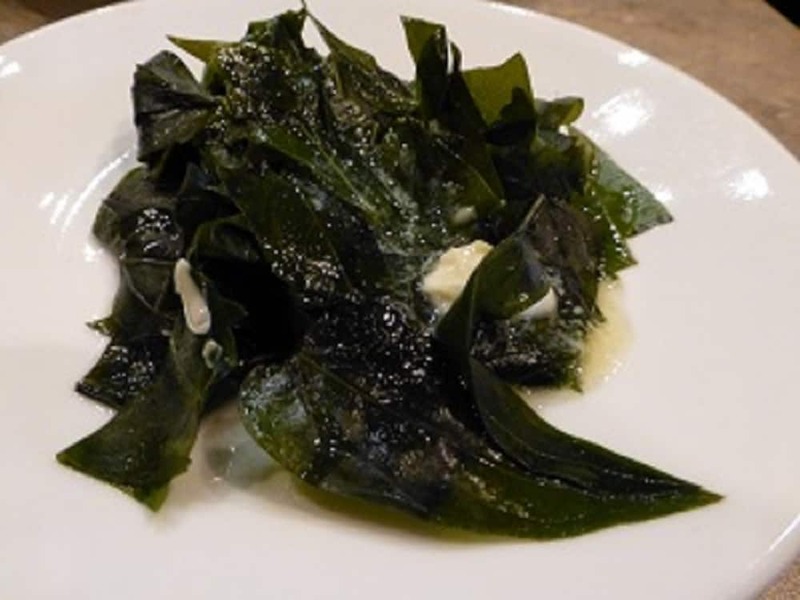 I wish I hadn’t waited so long because it turns out once the leaves are prepared the sulphur smell disappears and one is left with a very tasty, leafy, green similar to collard greens in taste and texture. It is quite delicious with a pat of butter and a little vinegar or sriracha sauce. Collecting tender new leaves is essential as older leaves are quite tough. I look for the new growth of tender new tendrils. New leaves tend to bruise easily and feel smooth on the underside whereas older leaves tend to feel thicker and coarser. Skunk vine gently boiled for twenty minutes and finished with some butter is quite delicious. Don’t even try it with kudzu or you’ll just get a mouthful of hairs … more on that in my kudzu article to follow. My first experiment with eating skunk vine was down and dirty … I just stepped out my front door and yanked handfuls of it off of a beautberry it was smothering … picked out the tender leaves and proceeded with my recipe. 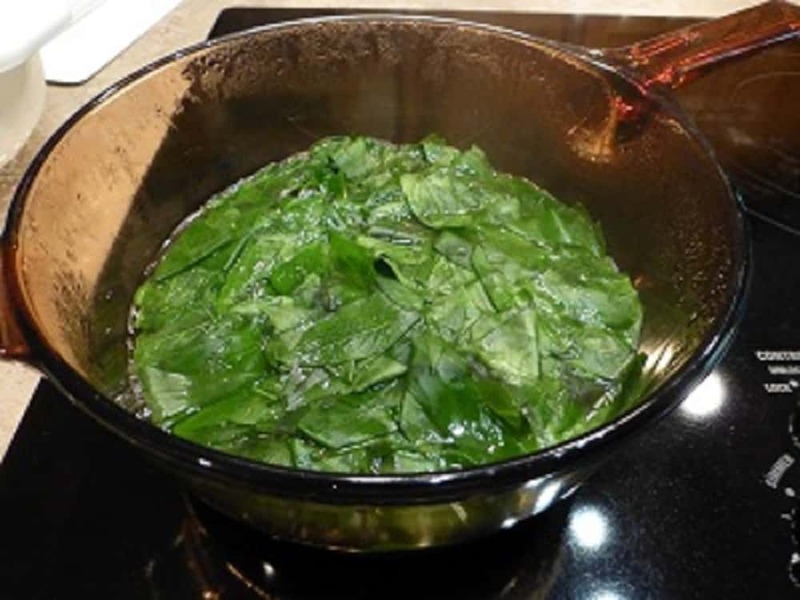 Depending upon the amount you are going to cook at one time keep in mind that 3 cups of loosely packed leaves amounts to ½ cup of cooked greens. At the time of this article, and the included photographs, I chose some vines right outside my doorway that had put out several feet of new growth on my beautyberry bushes. I collected about a large salad bowl amount and headed to the kitchen. I removed the leaves from the vines by grasping the petioles and then breaking the leaves off just after where they attach to their stems. I started a medium sized pot of water to boil and then rinsed the leaves in cool water. 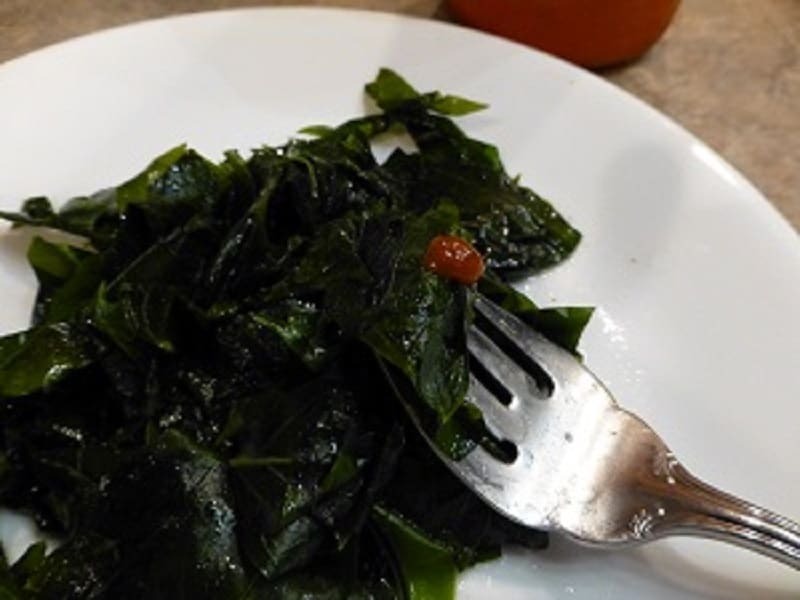 I cooked the leaves for 4 minutes and put them in an ice water bath and they were the texture of undercooked collard greens and just not quite the tenderness I was looking for. The typical odor of skunk vine was gone thankfully in that short amount of time. I continued to gently boil them for a total of 15 minutes and they were still a little too tough to my liking, but improving by the minute. Twenty minutes was the magic number for me … a nice chew and texture … not too tough nor too soft. I no longer bother with placing the cooked greens in an ice water bath as I did on my first experiment. Once I cook the skunk vine to my desired tenderness I just drain it and add it to a skillet of sizzling butter to toss and saute just until coated with butter. Depending upon my mood I may add hot sauce or vinegar at the table. Rather than being totally beaten by this invasive exotic why not try to fight back … by eating it? Give it a shot because I think you may be surprised and actually like it. If you can’t beat the weeds … why not eat them? Godofredo Stuart. Kantutan Paederia foetida. Philippine Alternative Medicine.